If you’re still with me (I don’t think I’ve ever covered a trip in as much detail), you’ve finally made it to the last post! Our final destination, the shining gem of California’s Golden Coast – San Francisco. Unfortunately for us though, there wasn’t really anything shiny about it. 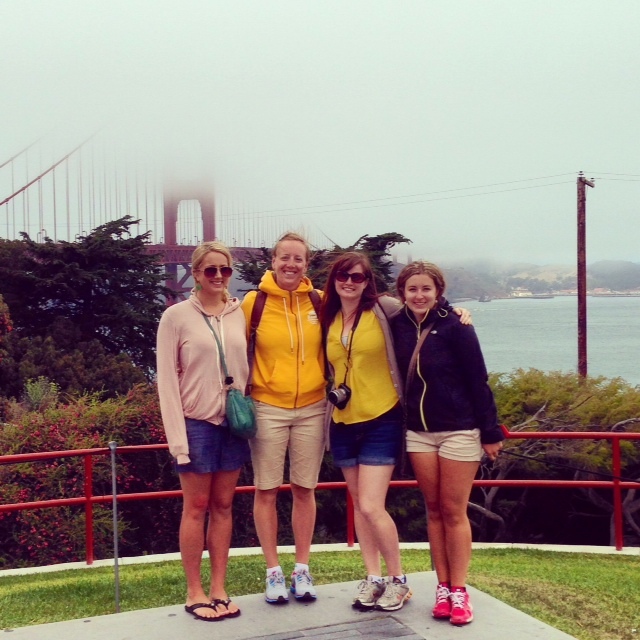 After the beautiful weather in Oregon, the sun deserted us and we spent three days on San Francisco’s foggy shore. 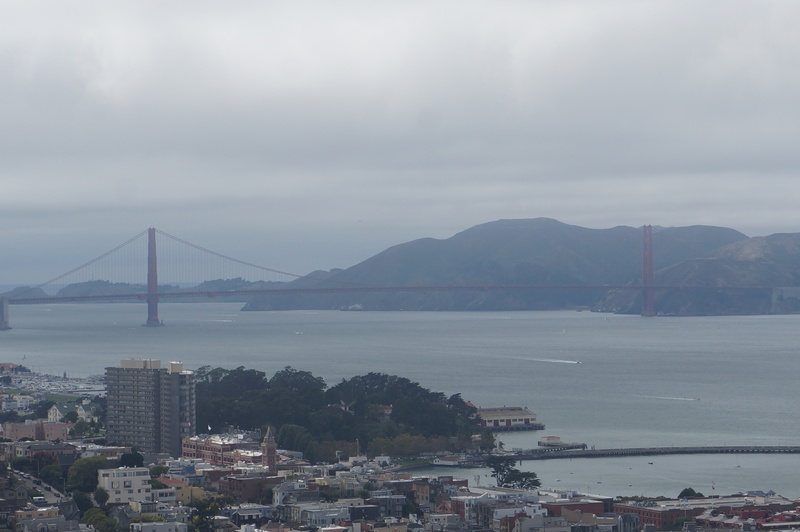 In hopes that the sun would peak its way out, we made the mistake of wearing shorts and t-shirt on our first day in the city and experienced a windy, cold tour of the city and crossing of the Golden Gate Bridge. But we’re all troopers and after a quick stop back to our hostel to change into some warmer clothes, we made the most of our short time in San Francisco. We took a whirlwind bus tour of the city, jumping off at San Francisco’s more popular attractions: the ever busy Fisherman’s Wharf, the steep, winding Lombard Street, and of course, Pier 39, home to hundreds of noisy and entertaining sea lions! We also stopped at the Golden Gate Vista in hopes of catching a glimpse of the bright arches of one of the world’s most famous suspension bridges, but they were sadly hidden in the fog and we had to settle for just a glimpse of the bottom. While there’s lots to see in the city, the highlight of our time in San Francisco ended up being a visit to the infamous Alcatraz prison (surely this place must have been JK Rowlings inspiration for Azkaban?). In case you don’t know, Alcatraz is a former federal prison located on an island in the middle of San Francisco Bay. Often referred to as “The Rock”, it was open from 1933 to 1963 and housed some of America’s most notorious criminals. Due to the harsh environment in which the prison was located and the high operating costs, it was eventually closed and now operates as a tourist attraction and national park. 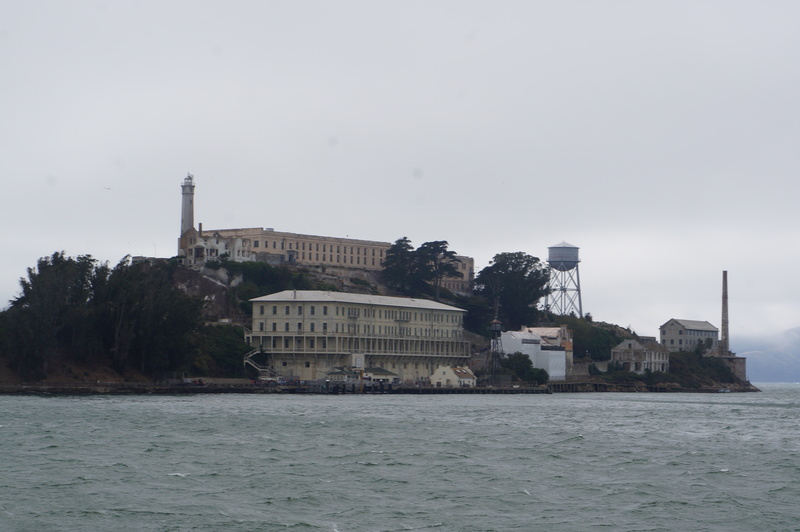 We took a boat across the windy bay and did an audio tour of the Alcatraz cell house. I have to give props to the makers of the audio tour because it was one of the best audio tours I’ve ever taken. The tour featured testimonies from several previous guards and inmates and provided a detailed history of the cellhouse and its famous prisoners and escapes. Our favourite tale of escape was that of several inmates who collected various tools (mostly spoons) and over the course of who knows how long, chipped away at the concrete around the air vent in their cells until they were large enough to crawl through. They made makeshift vents out of cardboard and other materials to hide the damage to the wall, and they created fake heads out of clay to put in their beds during the night of their escape to fools the guards. The inmates eventually escaped from their cells to a long utility corridor between the walls, where they climbed up the pipes and onto the roof. From there, they escaped on a life raft they made out of rain jackets! The prisoners were never found – it’s very unlikely that the raft or their bodies would not have been found if they had drowned – so it’s pretty likely that they successfully escaped! 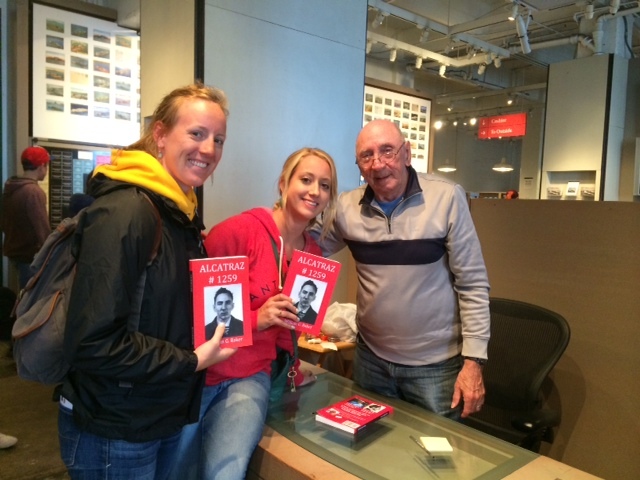 To our surprise, when we finished the tour and were perusing the bookstore, we discovered that an actual former inmate of Alcatraz, William Baker, was on site promoting and signing his new book on his time in Alcatraz! Gill and Mel both purchased a copy and had the somewhat surreal experience of smiling and posing for a picture with Mr. Baker. I didn’t read the book myself, but if you’re wondering, I’ve been informed by Gill that Mr. Baker originally went to prison for car theft. If he’d done the time he was sentenced for, he would have been out of prison in 4 years, but after multiple escape attempts he was eventually transferred to Alcatraz and ended up spending the majority of his life (he was only released in 2011 and is in his 80’s) in prison. Lucky for us, our visit to Alcatraz ended up being a huge pick-me-up after a slightly disappointing, and very cold morning. I would definitely recommend a visit if you’re ever in San Francisco, just make sure to get your tickets a few months in advance or you’ll have no hope of going. Since you have to take a boat there, there’s only a limited number of tickets. Sadly, Mel was only able to spend one day with us in San Francisco and then had to jet off to attend a wedding. We were sad to see her go, but enjoyed a beautiful trip to Napa Valley on our second day! It was another foggy start to the day, but as soon as we left the Bay area behind us, the sun came out and the day quickly brightened up! 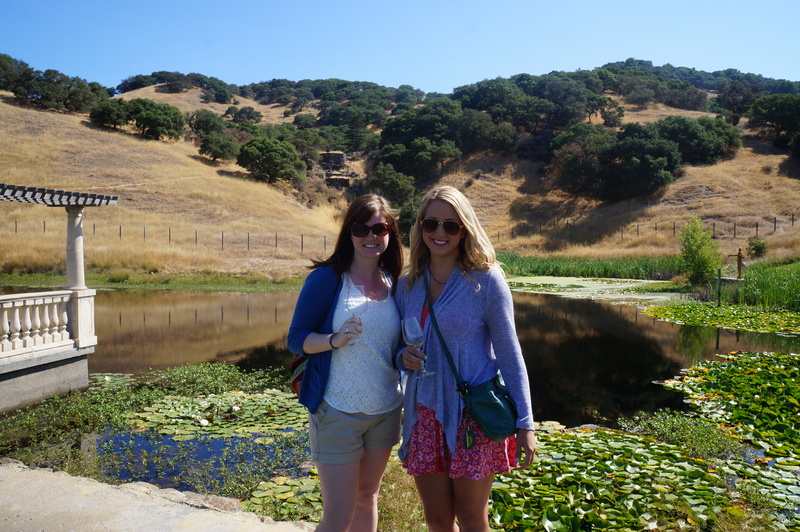 Napa Valley is California’s premier wine region and was incredibly beautiful. We started off with a drive through the Sonoma Region and over the course of the day visited three wineries. The first two were small boutique wineries that produce a few thousand bottles of wine per year, which are only sold at their winery. The last winery produces several million bottles per year and we thought it was nice to have the contrast of visiting both types. We had an enjoyable afternoon tasting the different wines and being taught much more than I ever needed to know about how to properly open and drink wine! Our last day in San Francisco was a bit of a freebie. We were originally going to spend our last day in Santa Cruz, but because we had to switch up the order of the trip when we missed Yosemite, we ended up having an extra day. We started the morning off right with a delicious Sunday brunch from the Cheesecake Factory, did a little shopping, and then split up for the afternoon. Karen spent the afternoon doing some shopping and exploring around Union Square, Gill made a visit to a childhood icon of hers, the ‘Full House’ house, and I walked through the city up to Coit Tower where I finally caught a full view of the Golden Gate Bridge! It was a more relaxing day and the sun finally came out for our last few hours in the city. That pretty much sums up our trip of America’s West Coast. We returned to Vancouver just over a week ago and Gill stuck around for a few extra days. Karen won’t be going back to Newfoundland at all though as she’s been accepted to study law at UBC, so you might be hearing more about her in my future exploits! I hope you enjoyed taking this journey with us – it was the trip of a lifetime for us and I loved sharing it! We crossed the border into California last Tuesday morning – unfortunately it was around this point that we hit a few bits of bad luck. It seems you can’t win with weather in California and it switched from sweltering (35+) to cold and thunderstorms. We drove down the eastern side of California, passing briefly into the sunny desert landscapes of Nevada. 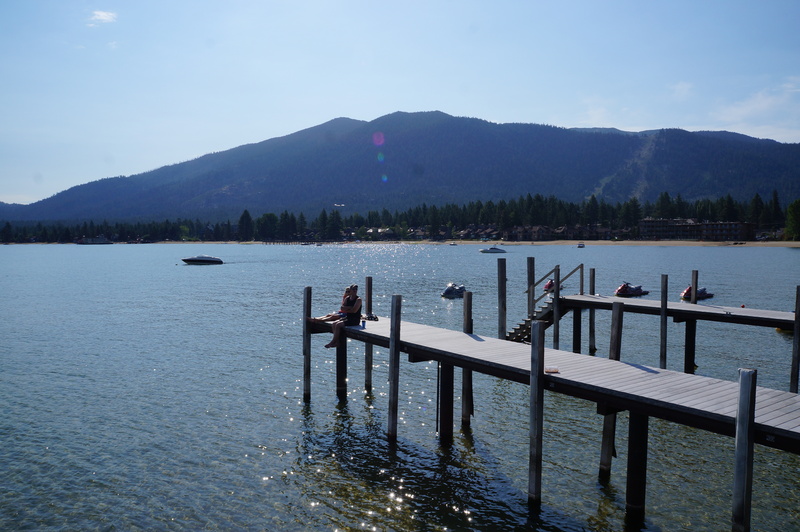 After passing through Reno we swung back into California to visit South Lake Tahoe. Lake Tahoe is a huge alpine lake, in the summer it’s a popular beach destination and in the winter it’s popular for skiing! Our morning in Tahoe started off promising; we got up early to enjoy the sun and myself and Melissa rented a paddle boat while Gill and Karen lounged on the beach. The lake is surrounded by mountains and the water is so clear and beautiful. We couldn’t help but hop out of the boat for a dip! We managed to fit in a fantastic brunch at IHOP as well, but after that things started to turn sour. The clouds and thunderstorms rolled in and we discovered that our next destination, the beautiful Yosemite National Park, was being ravaged by wildfires. We spent a good part of the afternoon trying to get a hold of our hotel to find out what was going on – it turns out we could still make it down to Yosemite Valley, but a lot of highways were closed and the extra time added to the journey in and out of the park meant that we would barely have any time there (it was also very smoky in the valley). So we decided to skip Yosemite. 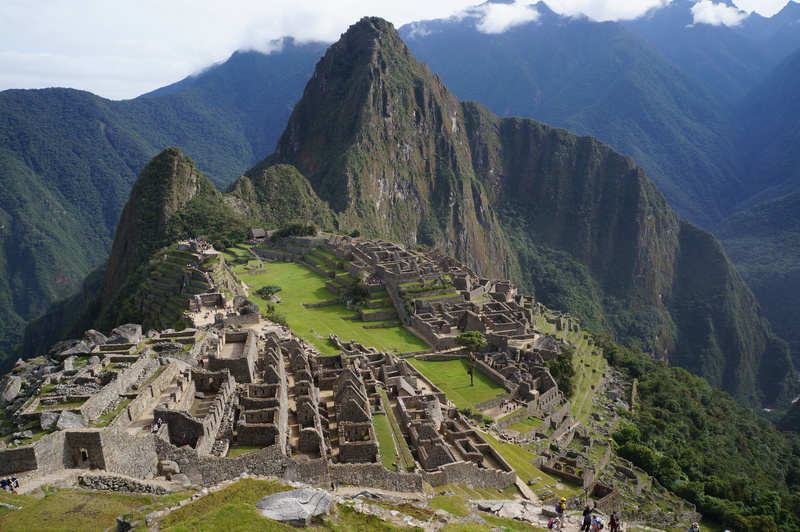 This was a hard hit for me since it was the part of the trip I was most looking forward to, but things can’t always go as planned and I think we made the right decision to skip it. In lieu of Yosemite, we went to Santa Cruz! We decided to leave the rainy weather in Tahoe behind and took off for the sunny west coast. Santa Cruz is a beach town about an hour outside of San Francisco. 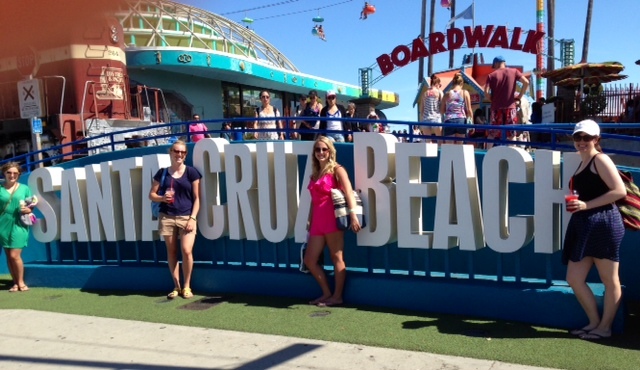 The main attraction is the beach and boardwalk, which if you ask me, is a brilliant combination! You can lounge on the golden sand and swim in the pacific, or you can take in all of the thrill rides along the boardwalk at the back of the beach! On windy days, you’ll find the town crawling with surfers. Mel and Karen opted to soak in the sun on the beach, but Gill and I broke up the day with several rides on the boardwalk! Our favorites were a wooden roller coast, this drop ride called double shot that threw you up in the air and let you freefall back down, and of course, a theme park classic, the swings! The view from the air was fantastic and we had a great afternoon trying different rides, going for a dip in the ocean, and sampling different treats from the boardwalk (dippin dots was a popular one). We finished the visit with a little shopping on the boardwalk, grabbed some slushies, and then took off for our final destination, San Francisco. Unfortunately, we had another bit of bad luck when we arrived in San Francisco – our hostel lost our reservation and we were forced to split up one night and then double bunk another. But we ended up getting one night free, which made up for our loss by skipping Yosemite (gotta look on the bright side). We’ve actually finished the trip now (I’m writing to you from back in Vancouver), but I’ve got one more post coming for you about the three days we spent in San Francisco. So stick around for one last entry! Gill’s vlog for this portion of the trip isn’t ready yet, but as soon as it is, I’ll post it at the bottom of this blog! We departed Seattle in the morning for our second destination, Portland! It’s only a 2.5 hour drive so we arrived just in time to head into the city centre to check out some food carts for lunch. There’s more than 700 international food carts located all over the city, so there was lots of selection to choose from. Gill, Mel, and Karen all had gourmet grilled cheese and had the BEST falafel I’ve ever had in my whole life (seriously, I’m still dreaming about it)! Our first impression of Portland is that it is one of the most chill cities. It’s Beerfest this weekend and since Portland has more microbreweries per capita than any other city in the world, there were a lot of people visiting. But even though the city is flooded with tourists attending Beerfest, it still felt completely relaxed. 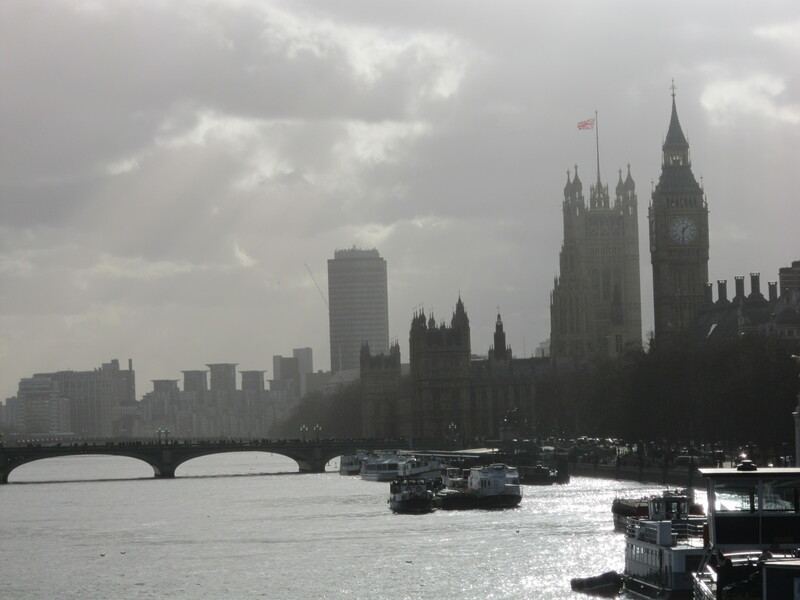 It’s so easygoing that after spending the day there, Mel decided it was her favourite city she’d ever visited! The first attraction we hit up was Powell’s Bookstore, which ended up being everyone’s favourite part of Portland. 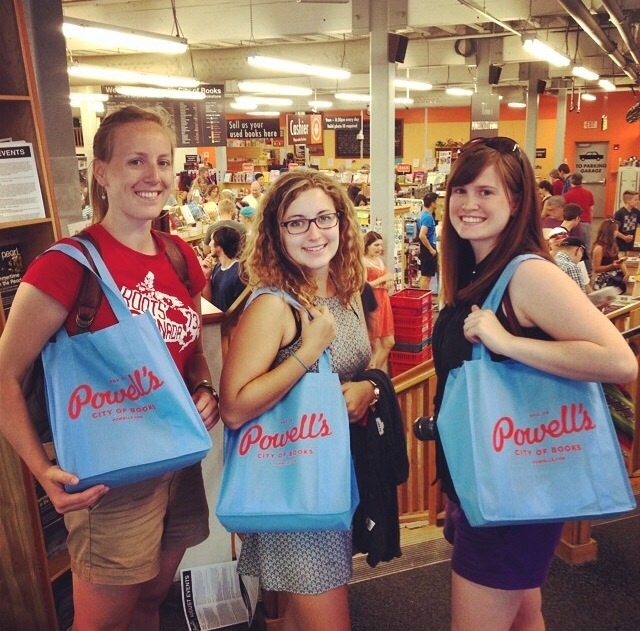 Powell’s is the largest new and second hand bookstore in the world, and as an avid reader it was a dream! The whole building is stacked to the ceiling with books and there’s several different rooms making up the bookstore – we spent an hour and a half wondering from the orange room to the rose room to the gold room. There were so many books that we all left with a full bag! After Powell’s we walked to Portland’s second largest attraction (or perhaps biggest attraction for some people), Voodoo Doughnuts! 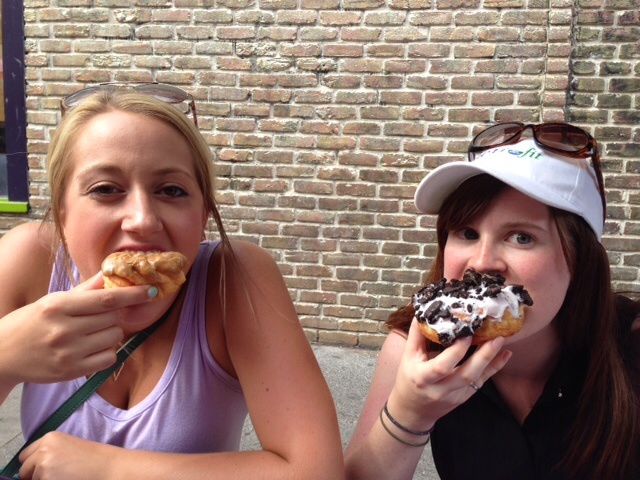 This famous doughnut shop had a lineup out the door to try some of the tastiest and most original doughnut creations. Between us we sampled the ‘Portland Cream’, ‘Maple Crueller’, ‘Dirt Doughnut’ (covered with crushed Oreos), and the ‘Miami Viceberry’! They did not disappoint and were easily the best doughnuts we’ve ever had! We had a bit of trouble figuring out what the best Portland landmarks were, so we decided to take a walking your with a local in the late afternoon. It was a great decision and we learned so many interesting things about the city! Portland is known for being chill and for being weird. The official slogan of Portland is “keep Portland weird” and the more we learned about its eccentric past the more appropriate it seemed. Only 40% of people living in Portland actually grew up in Oregon. The rare individuals that actually grow up in Oregon are referred to as Unicorns because they’re almost like a mythical species. The downside to having so many people moving into the city though is that Portland currently has the second highest unemployment rate in the country (second only to Detroit). We found this easy to believe as we saw a lot of homeless people around and it explains the high number of food carts that have popped up in the city as many people are forced to start their own business in order to sustain their livelihoods (the number of carts increased from 70 to 700 in 2009). However, we also learned many wonderful things about how green and sustainable of a city Portland is. They’ve had a global warming city plan since 1992, they heavily promote biking, they founded the car sharing industry, and they currently divert 66% of their waste out of landfills with recycling and composting programs (Vancouver is at 58%). We also learned that Portland is home to a large number of haunted buildings, as well as the worlds largest and smallest city parks! Overall, it was an interesting and educational tour and we loved the opportunity to learn a little more about this unique city. We’ve now departed Portland, but as we drove east across the mountains we discovered that the rest of Oregon is just as interesting and beautiful! We hit the long driving stretch of our trip as we made our way towards California and we had an incredibly scenic drive through Oregon. We drove through dense, old growth forest, past snow peaked mountains, across golden desert plains, and over ancient volcanic lava flats. We spent a whole day driving through Oregon, but we kept the trip interesting with a stop at the ‘Lava Lands Visitor Center’ to check out an old volcano and see the rock lava flows that still descend from the volcano. We drove to the top of the volcano, or ‘lava butte’ and I found it really interesting because you could see how the lava had wiped out every living thing and that the tree line quickly picked up again at the edge of the lava flow. 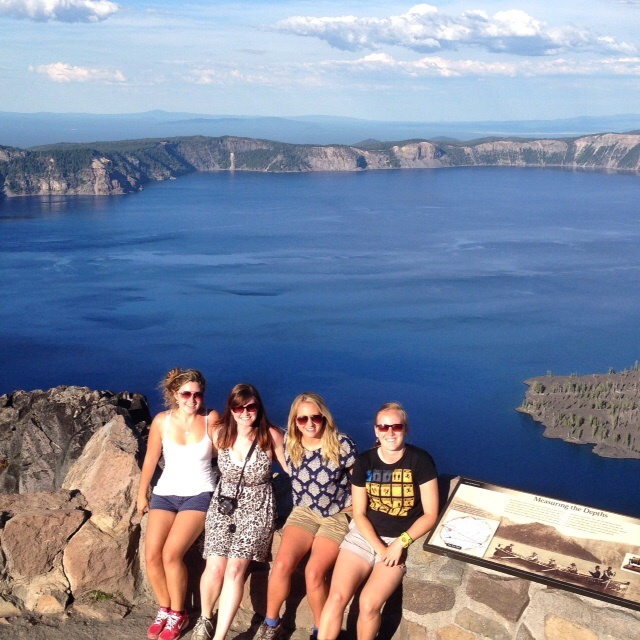 We also stopped into Crater Lake National Park and enjoyed incredible views on the lake which now fills the crater of a gigantic ancient volcano. It’s the deepest lake in the United States – we hiked up to a tower called ‘The Watchman’ to get an even better view of the stunning mountain vista. Crater Lake is one of many mountains and the backdrop of the mountains surrounding Crater Lake were just as jaw dropping as the lake itself!